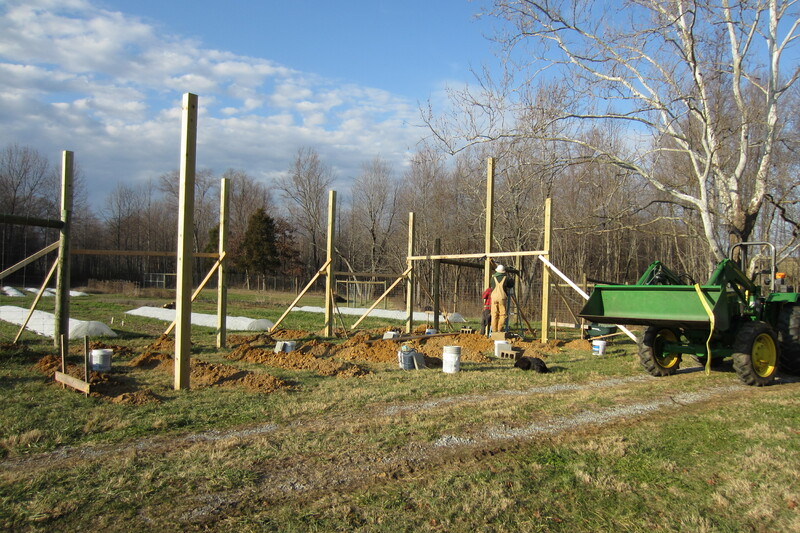 This shed has been in the making for over a year, and we’ve finally broken ground over the past couple of weeks. 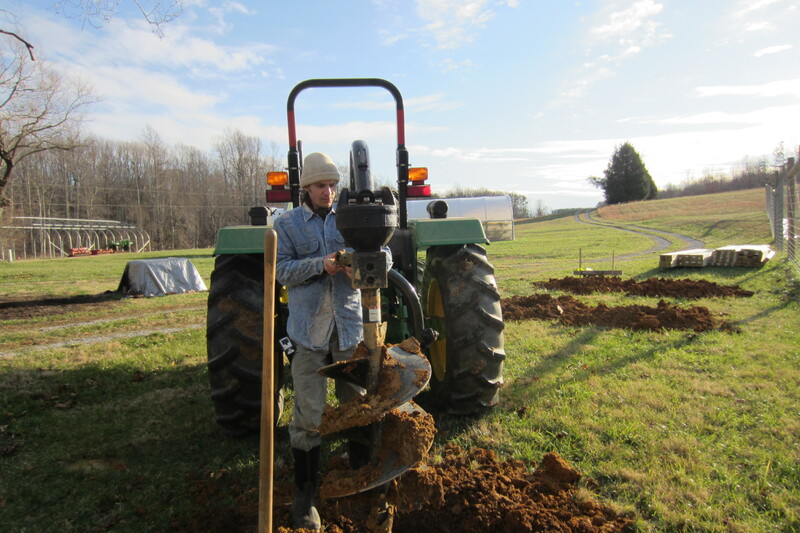 Gavin rented an auger to dig the 12 post holes. 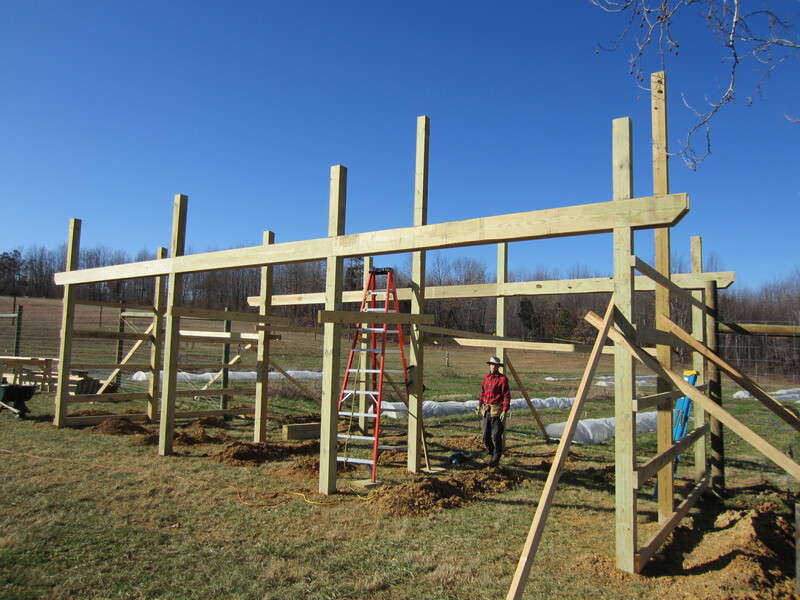 The shed site straddles the fence-line. We had some fence remnants covering the hole this past year so deer couldn’t get through. 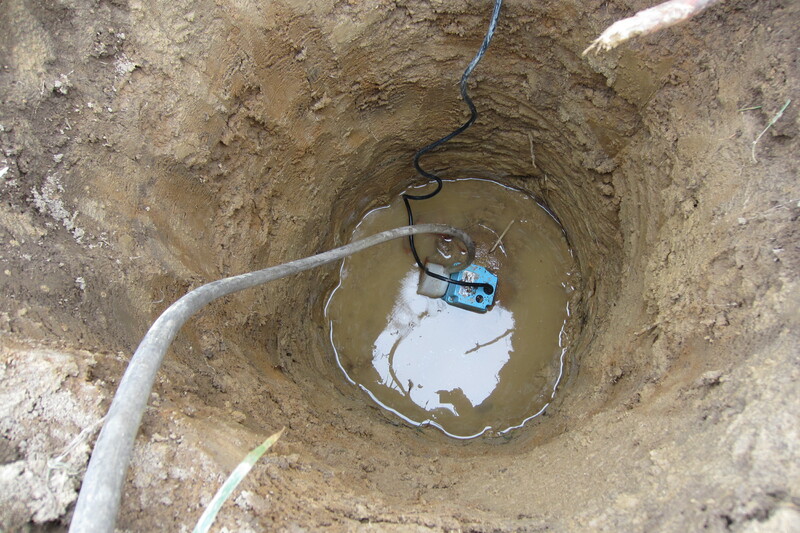 The holes are about four feet deep. 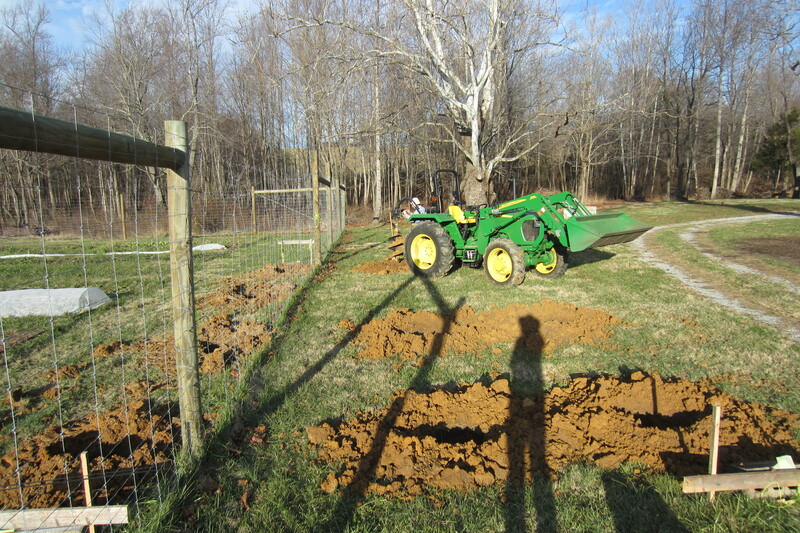 Here you can see the break in the fence a little better, and the location of the shed in relation to the rest of the farm infrastructure. 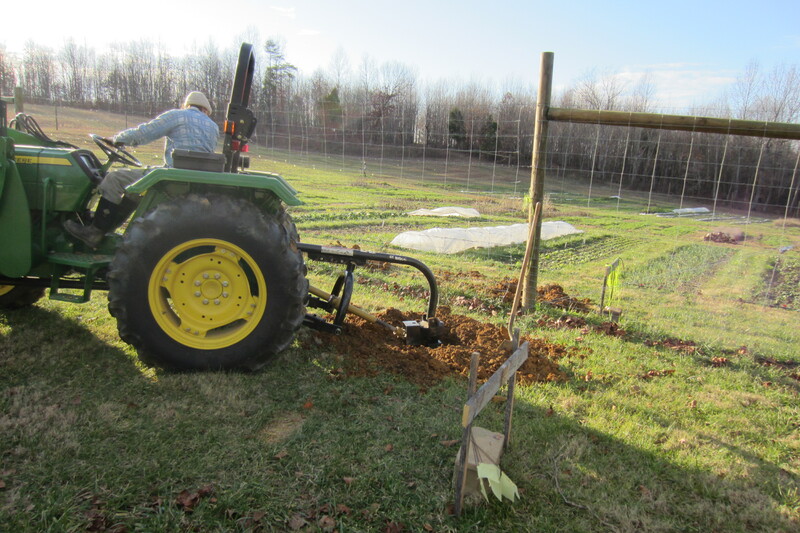 We’ll use the shed for storing tractor implements and garden tools. 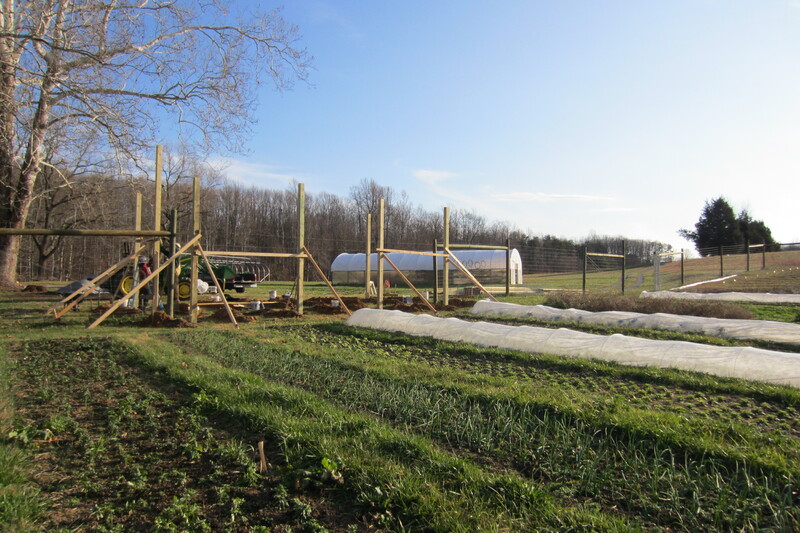 This extra space will provide storage for most of what is now in the greenhouse. 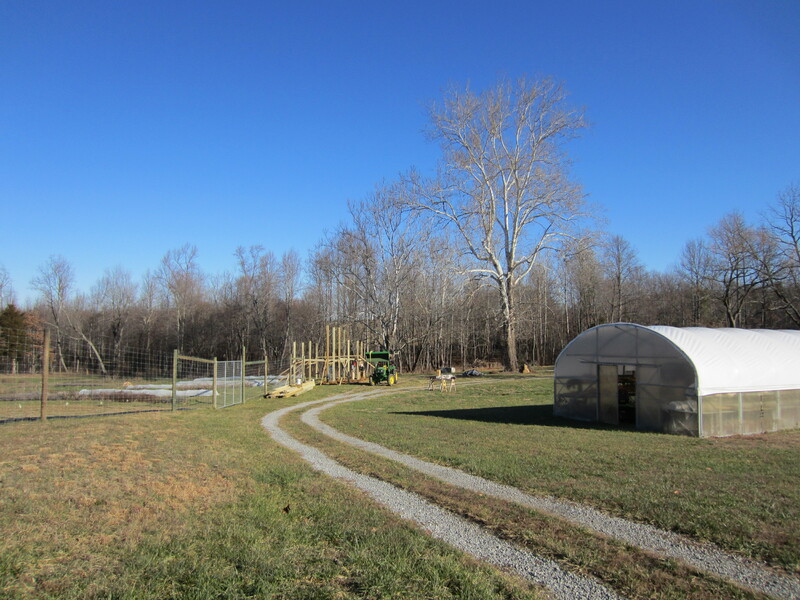 Then we’ll be able to use the greenhouse for it’s intended purpose: growing. 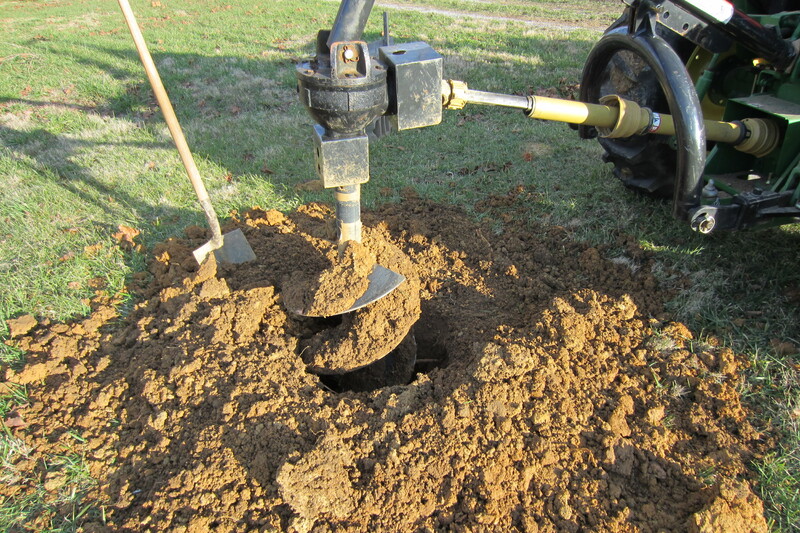 The post holes go down to the water table, so we used a pump to remove some of the water before setting the posts. 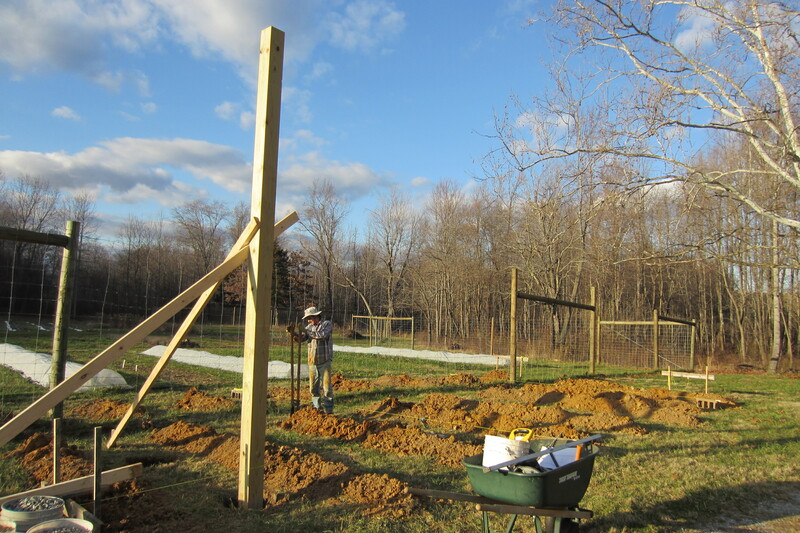 We used gravel and concrete pavers underneath the posts, and poured dry concrete in around the posts. It took over 400 lbs of concrete to fill each hole! 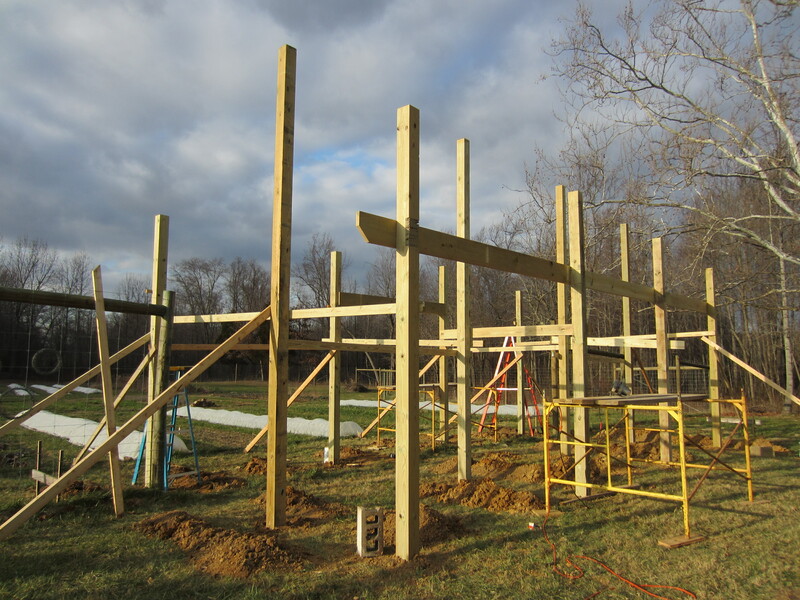 Corner posts up! Thanks to my Dad for his expert help! These posts are quite heavy: 6″ x 6″ x 20′. 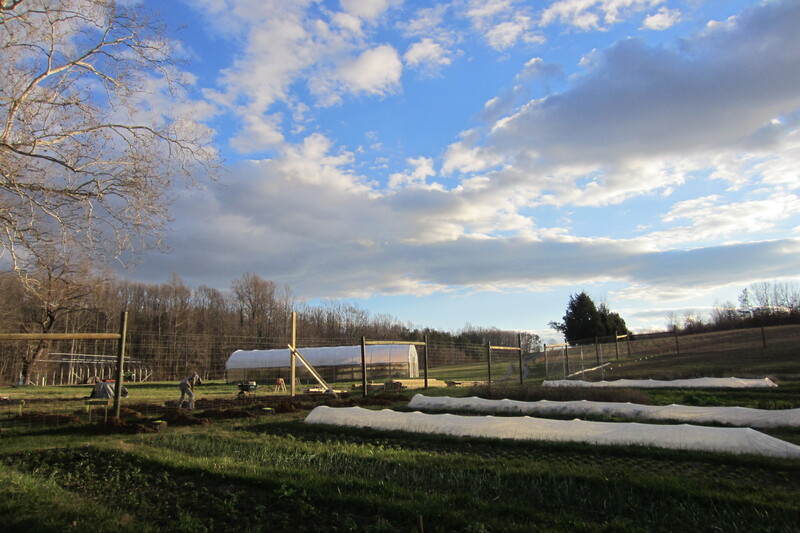 Many of our beds are filled with crops for next year! 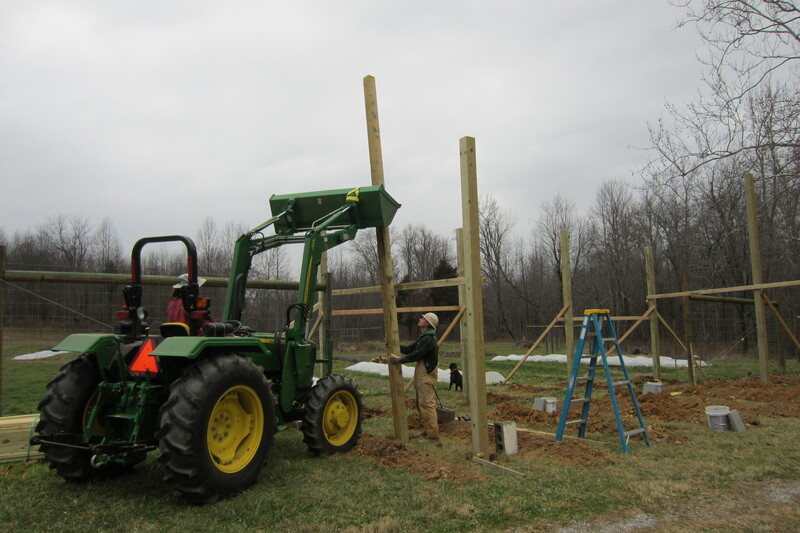 Setting a post using the tractor’s lifting power. A view from outside the fence. 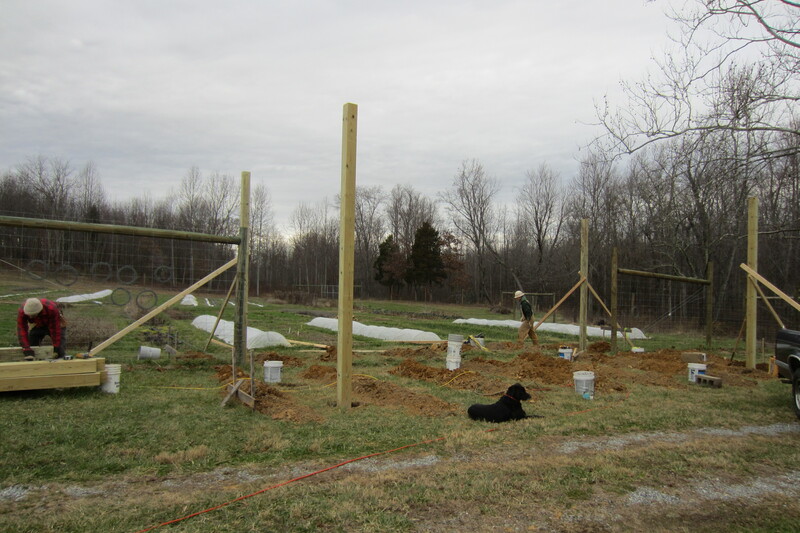 All the posts are up. Front and rear beams up. We’ve had very warm weather for January. It makes the work a lot more pleasant! Looks great !! Hopefully, the weather will remain warm ! Thanks Arnie! We have been lucky that it’s been so nice out!